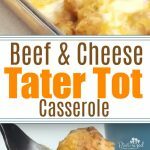 Beef and cheese tater tot casserole is the perfect, hearty meal for your comfort-food loving family! Does your family love tater tots? They are endangered around our home! Especially this tater tot nachos recipe...but I digress! Several times a week my husband will sneak downstairs when the kids are in bed and preheat the oven. Everyone knows what he’s doing. He’s baking up a batch of tater tots for a late night snack. But he doesn’t bake his tater tots any old way. He always squishes nine tater tots into one rectangle. Then, he gently places one slice of cheese on top and pops the tater tots back in the oven for about one minute for the ultimate finish. 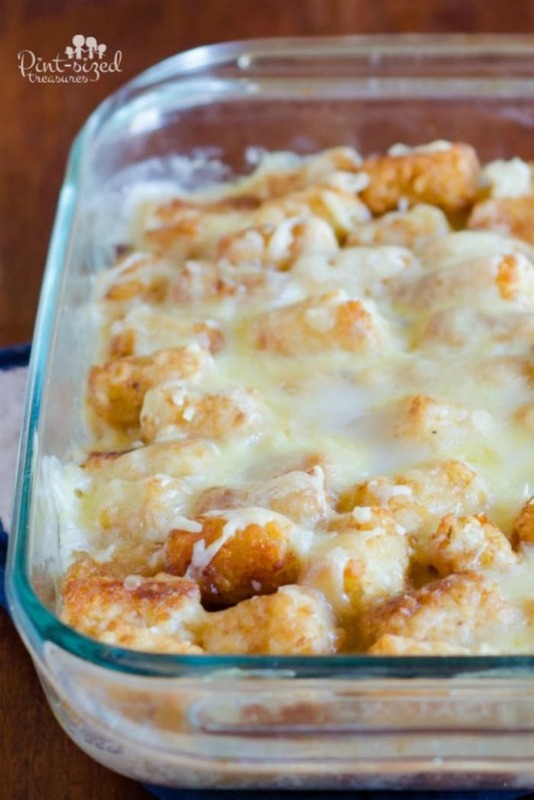 But this tater tot casserole is our secret to indulging in tater tots during the week. When you add the beef, spices, cheese and the creamy sauce you can excuse yourself for eating tater tots as a meal — not a snack! Casseroles are awesome for busy families. They create a yummy, one-dish meal that you can pop in the oven while you set the table, fix the drinks and throw on pot of coffee. My younger brother broke some incredibly sad news to me about 15 years ago. With trembling hands I type his exact words. “Not even breakfast casseroles?” Someone SHOULD have asked. And I already know the answer…not EVEN breakfast casseroles. To this day, we all shed a tear at his dull, mundane life. But for the rest of the world who love casseroles, let me ease your mind. This recipe does not use canned soup. Sure, you can sub my easy, homemade cream soup recipe with a canned version, but trust me — homemade is best. Of course it’s healthier and cheaper, but it also tastes sooooo much better. Even my kids know how to make the creamy, homemade sauce now. You can use in oodles of recipes! 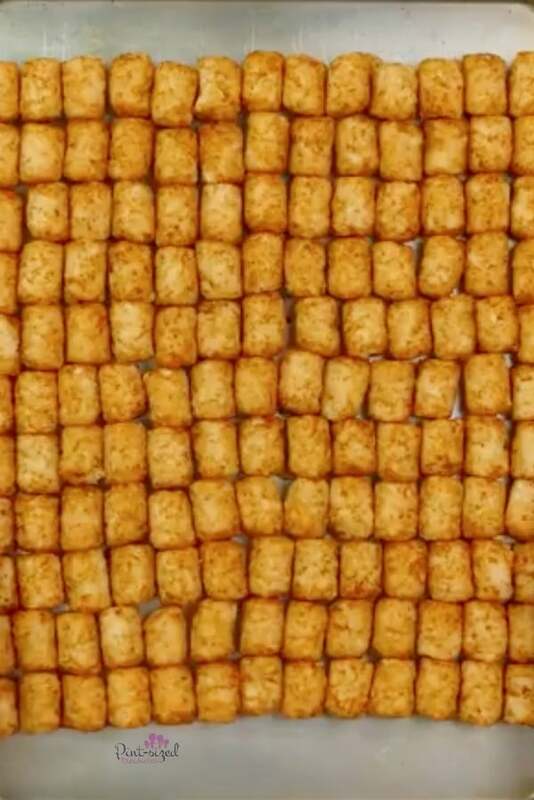 Want to have tater tots for breakfast? I’ll tell you a simple switch you can make! Substitute the beef mixture with a crumbled sausage mixture. But if you want to wake up to a homemade danish like I do, here’s a recipe for you too! Oh, and you can make a tater tot casserole in the crock pot! Here’s an awesome slow cooker recipe you can try for an easy casserole!! 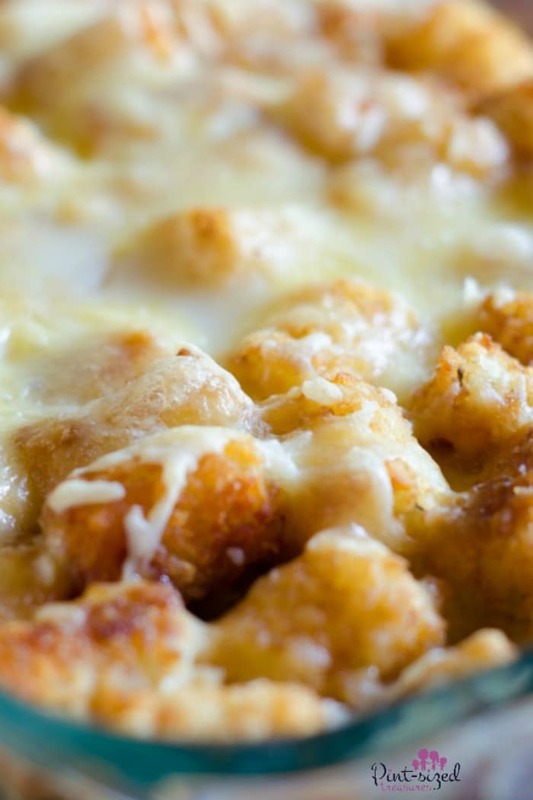 Want Another Tater Tot Casserole Tip? Don’t forget to take time to bake your tater tots first. Have you ever eaten mushy tater tots? 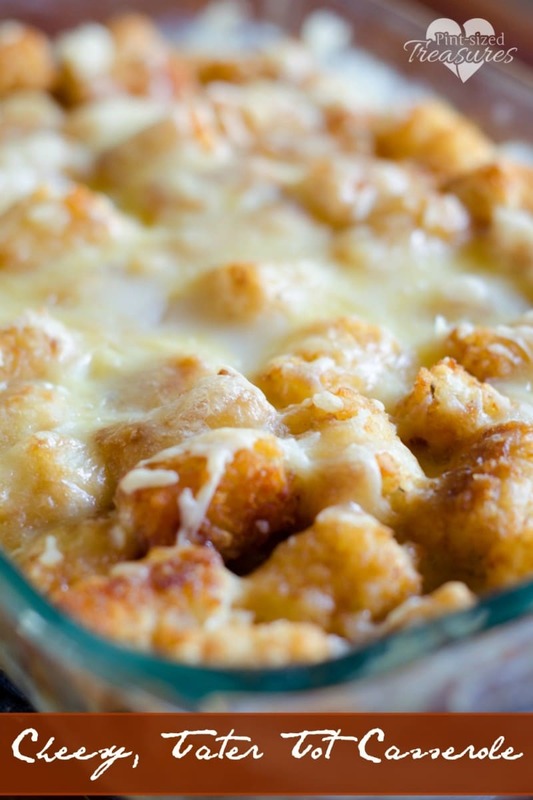 Bake those cute tots first, then add them to your cheesy casserole. Ready to dive in and enjoy a hearty, potatoey, cheesy casserole? Print out the recipe below! 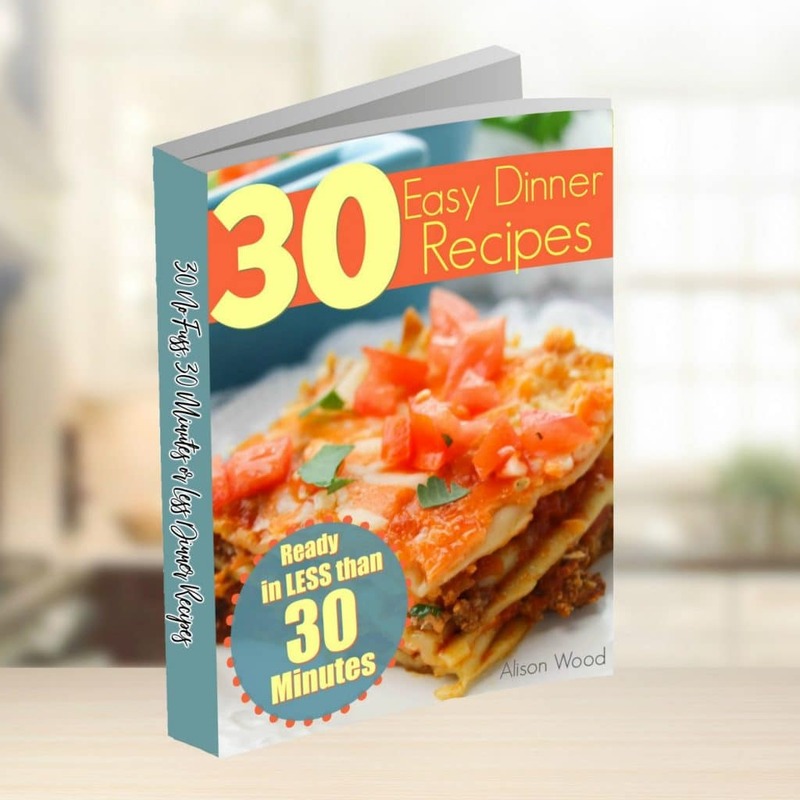 Be sure to check out our 30 Minute Dinner Recipes Book! You’ll LOVE it! 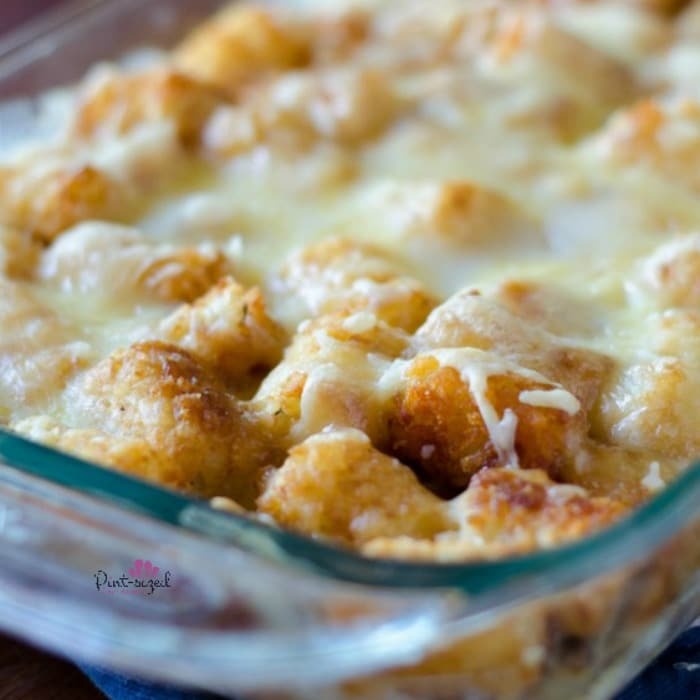 Tater tot fans will LOVE this beef and cheese tater tot casserole that's packed with spices, homemade cream sauce, cheese, beef and tater tots! Indulge in a comfort food ,family-style casserole! Place tater tots on an ungreased cookie sheet and bake until golden brown and crispy. In medium-sized skillet, cook diced onion and ground beef in two tablespoons cooking oil. Cook until beef is no longer pink and onions are tender. Add Worcestershire sauce and 1/4 cup water and continue cooking for two minutes on low. In medium saucepan, bring chicken broth and 1/2 cup milk to a low boil. Stir chicken seasoning, flour, salt and paprika in small bowl. Add flour mixture to the remaining one cup milk and whisk until smooth. Add milky, seasoned mixture to the saucepan. Continue to cook on low for 5 minutes and stir or whisk continually. Place ground beef mixture in bottom of 11 x 7 baking pan. Sprinkle half of the cheese on top. Place tater tots on top of cheese. 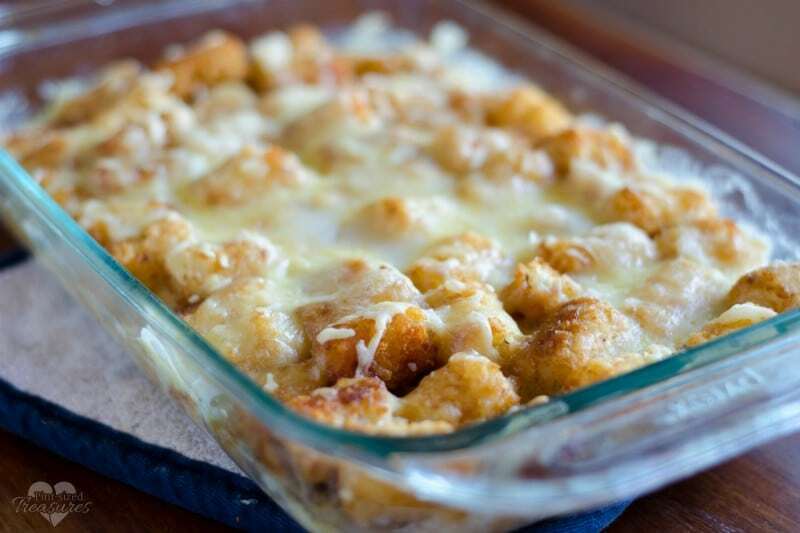 Pour cream of chicken mixture over tater tots and top with remaining cheese. Bake for 20 minutes at 400 degrees Fahrenheit. Enjoy!